The joy of being a grandparent is seeing the budding of a new generation. With two granddaughters and another on the way, we enjoy watching the cycle of life repeat itself. As much as babies and toddlers depend upon adults, it is always fascinating to see how intrigued they are by one another. 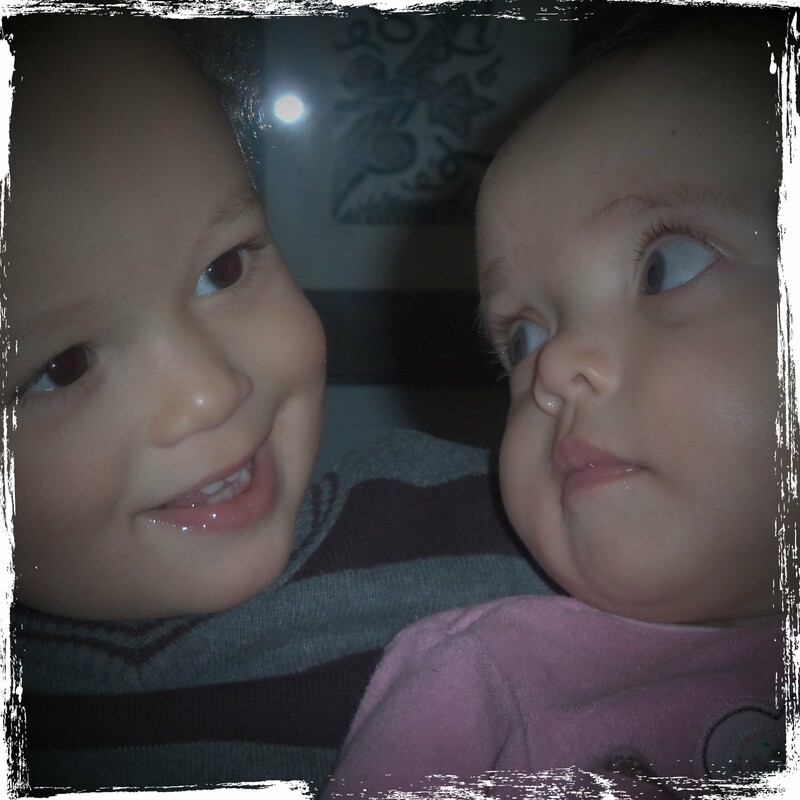 My foreshadow pictures are of my granddaughter and friend, who adore one another. In fact, Daniel, a year older than Georgia and living about three hours away, tells his mother that he misses her. Their mothers joke about them being married one day, with Daniel’s mom wanting to work out a betrothal agreement. Will they? Time will tell, but I hope these pictures represent the foreshadowing of a loving marriage to come in both of their futures. This entry was posted in Photography, Relationships and tagged foreshadow, marriage, postaday, Weekly Photo Challenge by Chuck Spindler. Bookmark the permalink. Now that’s the look of love between those two! Such cute kids and really cute pictures. Thanks for sharing. Thanks, Joyce. With the special bond that their parents have, I wouldn’t be surprised that these two remain special friends for life. I love your take on this challenge… who knows what the future will bring, but the look in thier eyes is adoration, love and acceptance. beautiful photo, beautiful children. Thanks! Enjoyed your “foreshadow” story, too. Looked and sounded like a challenging trip. Our children and grandchildren foreshadow the future! These are great photos. That is so true, Angeline. Thanks! Haha, that is cute. A great photo to break out when they get older. Yes, Busanee…I already thought it would be fun to recreate the same photo as they grow older. Oh that would be so beautiful. What a wonderful gift it would be to see their friendship ( maybe more serious relationship? 😉 ) grow through the photos. LOL, they are beautiful but let’s not get them married quite yet!!! Agreed, Tina…we want them to wait until an appropriate age! However, my older granddaughter (age 3) is already talking marriage with her best friend, Parker. The other day she wanted some flowers for her and “Parper’s” wedding. I think the fixation comes from having recently been a flower girl in her aunt’s wedding. Nice foreshadow, and lovely imagining! Enjoyed reading about Ruthie Mae’s birthday. We gave up our dog a few years ago, but have occasional visitation rights when the new owner goes out of town, since we would rather she not have to be boarded. Always good therapy to have her visit. Thanks…enjoyed your “foreshadowing” of a splash, too! You are absolutely correct, having 7 grandchildren we can agree with you. Good choice for the challenge. Thanks for the kudos, James. Enjoyed visiting your site and seeing your take on “foreshadow.” I’ve never seen a rainbow hug a mountain quite like that…beautiful. Thanks for connecting. Your welcome and thanks for visiting my site. An adorable snapshot. The romantic in me really want them to marry and live happily ever after. It’s why I like cheesy songs like Best Friend by Jason Chen which tells the story of best friends since 10 years old falling in love later in life. Thanks. The mothers have such a wonderful relationship, I’m sure they will at least be best friends.